Most of the world’s languages are written alphabetically; in an alphabetic writing system the basic components represent sounds only without any reference to meaning. For example, the letter “b” in English represents a voiced bilabial stop, but no particular meaning can be attached to it in its function as a letter of the alphabet. Chinese writing is logographic, that is, every symbol either represents a word or a minimal unit of meaning. When I write the character , it not only has a sound, niu, it has a meaning, “cow.” Only a small number of symbols is necessary in an alphabetic system (generally under 50), but a logographic system, such as Chinese writing requires thousands of symbols. From the aspects of sound, every Chinese character represents one syllable. Many of these syllables are also words, but we should not think that every word in modern Chinese is monosyllabic. The word for “television,” for example, is , dianshi; since this word has two syllables, it is necessary to write it with two characters. Each of these characters has an independent meaning: dian means “electric,” and shi means “vision”; in this particular case neither of the characters can be used alone in modern Chinese as a word; however, in the Chinese of two and a half millennia ago, both characters were independent words. So, when we say that Chinese has a logographic writing system, one in which each basic symbol represents an independent syllable, we are speaking of the Chinese of a much earlier period. How many characters does the average literate Chinese person know? Studies carried out in China have shown that full literacy requires a knowledge of between three and four thousand characters. Learning so many characters is very time-consuming and places a heavy burden on students. This has led many Chinese in the past to advocate the abolition of characters in favor of an alphabetic system, but such programs have met with little success. We will return to the question of script reform below. Although literacy requires the knowledge of a few thousand characters, the total number of characters is much greater. A dictionary produced in the eleventh century contained more than fifty-three thousand characters. Even when one takes into account that many of these characters represented rare words and many others were merely different ways of writing the same word, the number still seems staggering. Fortunately, the average person is required to know only a small percentage of this enormous number. It is interesting that both printing and movable type were invented in China. The latter, however, was little used until modern times. Most printing used wooden blocks on which characters were carved individually in meticulous detail. Undoubtedly the reason for this was the large number of characters used in ordinary printing; it was easier to carve individual blocks than it was to create a stock of several thousand type and set it by hand. On the other hand, movable type is eminently suited to alphabetic writing systems. Nowadays characters can easily be written on a computer, and older methods of printing are rapidly disappearing. Chinese writing has a history of some three thousand five hundred years. It is not as old as Sumerian or Egyptian writing; there is no certain evidence, however, that the invention of writing in China was in any way stimulated by the earlier existence of writing in the Near East. 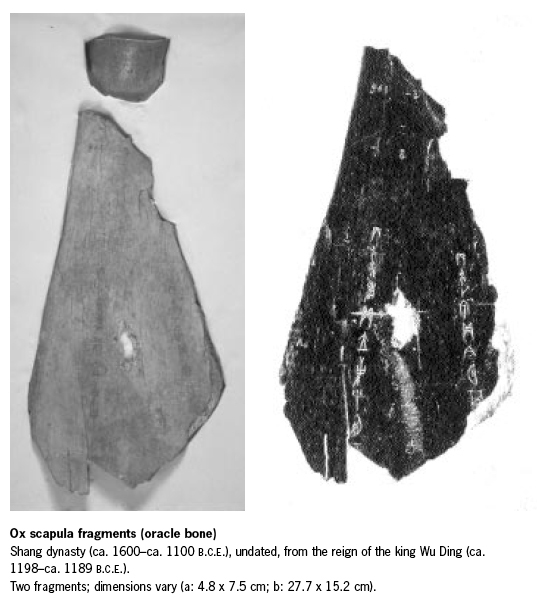 The earliest examples of Chinese writing are divinatory texts written on bones and shells. These usually consist of a question put to a diviner along with his answer. This earliest Chinese script shows that in its earliest history, Chinese writing was based on pictures. The word for “cow” was clearly the picture of a cow's head; “to go” was written with the picture of a foot. However, a little reflection shows that it is impossible to have a fully pictorial system of writing. How would one depict, for example, some abstract grammatical notion such as “completion of an action”? It would seem that from the very beginning of writing certain symbols that originated as pictograms were used for their sound alone, and it was only when this phonetic use of characters was introduced that a complete graphic record of language was possible. In the history of Chinese writing the number of characters that contained a phonetic element grew progressively, but Chinese never abandoned the principle of one character per word (or at least one character for each meaningful element). In the earliest Chinese writing its pictographic origins are still quite obvious. Over the course of time, however, the script underwent many changes, so that by the Han dynasty (206 BCE–220 CE), the script had lost most of its pictorial quality. The present-day standard script (called kaishu in Chinese) took shape during the third and fourth centuries CE. After that the form of the script remained surprisingly unchanged until modern times. In addition to standard forms, there are also several cursive forms of the script; the two most common are caoshu and xingshu. Caoshu, which means something like “drafting script,” is highly cursive and difficult for people without special training to read. Xingshu is a sort of compromise between the highly cursive caoshu and the standard script. It is widely used by ordinary Chinese when writing letters or engaging in other informal sorts of writing. The art of calligraphy is highly developed in China. For this purpose a traditional writing brush is employed, and the calligrapher may specialize in one of several different styles. Calligraphy is one of China’s major visual arts, many painters and scholars were also accomplished calligraphers. The cultivation of artistic writing is only one of many practices that show how deeply the writing system is rooted in Chinese culture. Despite recurrent suggestions to replace the traditional script with alphabetic writing, with all its obvious conveniences, the Chinese writing system remains integral to Chinese self-definition. In a country with hundreds of different dialects a common script that is independent of this dialectal diversity is a powerful symbol of national unity. In the 1920s and 1930s, many Chinese intellectuals viewed the script as a serious problem in China's attempt to become a part of the modern world. It was portrayed as cumbersome, difficult to learn and out of date. As a result, many advocated the outright abandonment of the traditional script in favor of an alphabetic system. Contrary to what many have claimed, there is a reason that Chinese cannot be written alphabetically, and a number of practical orthographies have been proposed. One problem that the proponents of alphabetic writing were not able to overcome was that for such a writing system to be practical, it would have to be adapted to various regional dialects; such a move was viewed as potentially divisive and harmful to the idea of a single Chinese nation. Ultimately all such ideas were abandoned, and attention turned to simplification of the traditional script, the idea being that the writing system would be easier to learn. It was not until the 1950s that effective steps were taken to carry out such a plan. In 1956 and again in 1964, lists of simplified characters were officially adopted in the People’s Republic of China. Hong Kong and Taiwan continued to use the traditional characters, a situation that still prevails. In 1957 an alphabetic system called pinyin was introduced in the People’s Republic of China as an auxiliary system to be used in teaching correct pronunciation in schools and for use in various sorts of reference works, chiefly dictionaries. Note, however, that there have been no practical steps taken to use Pinyin as an official orthography in Chinese. For the foreseeable future, there seems to be no prospect of abandoning the traditional logographic script. At different points in history the Chinese script was adapted by several neighboring countries—Vietnam, Korea, and Japan. For centuries classical Chinese was the official written language in these countries. Vietnam has now adopted the Latin alphabet, and, while Korea has had its own script, hangul, since the fifteenth century, it has only come into widespread use in the last one hundred years. Chinese characters still enjoy official status in Japan, and, as in China, there seems to be little chance that they will be abandoned anytime soon.